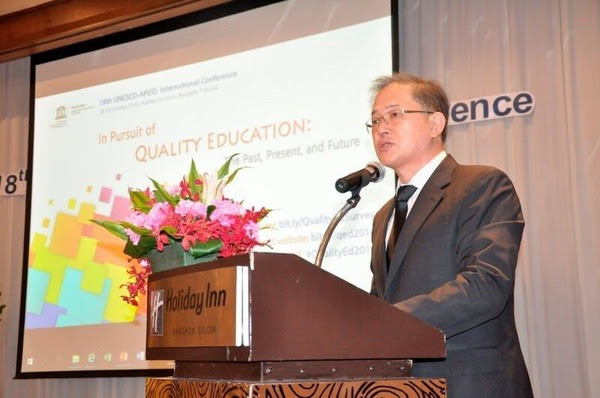 Bangkok: “To make sense of an increasingly interconnected world, we need new and innovative ways of thinking and actions – this requires quality education at all levels,” said Dr Gwang-Jo Kim, Director of UNESCO Bangkok, the Asia-Pacific Regional Bureau for Education at yesterday’s opening of the 18th UNESCO-APEID International Conference: In Pursuit of Quality Education: The Past, Present and Future. The three-day conference brings together about 180 policy-makers, researchers, academics and teachers to explore what quality education means, discuss key obstacles and share innovative practices that are improving learning throughout the region. The Education Minister noted that while all countries in Asia-Pacific have the same deadline to achieve the Education 2030 goals, “the distance from the starting points to these achievements is not equal for all”. Mr Mahbubani argued that we are entering a “a new era in world history” where Asia would assume increasing prominence and where Asian universities would play an increasingly important role. He cited China as a country where a “miracle in higher education” had taken place, with the country’s cohort participation rate in higher education going from 3% in 1990 to 30% in 2013. Mr Mahbubani also highlighted India’s success, where the rate has gone up from 6% in 1990 to 24% in 2013. However, Mr Mahbubani noted, quality of higher education in both countries has not kept pace with the rapid expansion in quantity – a situation common elsewhere in Asia and one that he says must be addressed for the region to assume a leading role in higher education. Among the themes to be explored during the conference, which concludes on Friday, will be: concepts and frameworks of quality education; innovations for increasing the quality of education; assessment, monitoring and evaluation of quality education; and effective policies and strategies for quality education.